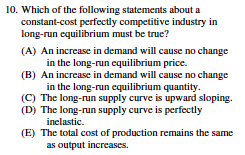 Answer - (A) an increase in demand will cause no change in the long-run equilibrium price. Understand that constant cost industries in long-run equilibrium are producing at the bottom of their SRATC and LRATC curves. They are productively and allocatively efficient. Firms can enter and exit and the price of the good will not be affected. The LRS (long-run supply) curve is horizontal or perfectly elastic. When demand increases then the industry supply will adjust in exact proportion to the increase in demand. Long-Run price returns to the original price. Long-Run Average Total Costs must be falling as when inputs are added output is larger proportionally than the inputs. Costs are falling as we add inputs. The LRS curve is downward sloping as the firm has economies of scale. (It needs to expand) - Demand increases and industry supply increases proportionally more than the change in demand as resource prices fall due to Economies of Scale. We are on the downward sloping section of our LRATC curve. 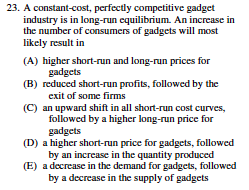 Answer - (D) a higher short-run price for gadgets, followed by an increase in the quantity produced. but it is referring to short-run affects. IN the short-run as population increases (demand determinate) demand increases causing prices to rise,,, and in the short term firms respond by increasing the amount of labor they have to take advantage of the higher price to make profits. In the long run firms will enter (chasing profits) and the competition will force prices back to the original long-run equilibrium price. Why? the original price? 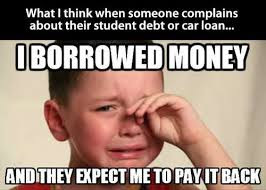 It's a constant cost industry. Answer - (C) It's long-run average total costs will fall. Of course it can only do this in the long-run as capital can only be added and firms can only enter in the long-run. As it adds more capital or expands its total costs will fall (its LRATC's will fall) as we can se form the above graph.